2018 was a very good year for Hövding with a growth of +63%. The year’s key markets, Sweden, Denmark and Germany, have all experienced strong growth. Above all, it’s interesting to see how positive the development has been in Germany. Sales in that market increased in 2018 by +96%, and in the second half of the year by as much as +118%. Hövding Sverige AB (publ) launches partnership with leading UK bicycle retail chain Cycle Republic. 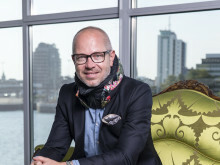 Hövding will be introduced to their flagship store and online ahead of this year’s Christmas trading, with further introduction into the remaining Cycle Republic stores during 2019. ​130,000 of Hövding’s airbags for cyclists are now in circulation on our roads, with almost 20,000 sold in the last three months. 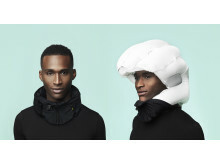 More and more people choose to stay safe in traffic by wearing a Hövding, and this is evident in the company’s third quarter interim report. As the autumn/winter darkness approaches, it is more important than ever to be visible in traffic. Hövding, the company behind the renowned airbag for cyclists, has therefore taken its reflector accessories to the next level for its new autumn collection of covers – complete with a newly developed material with rainbow-coloured reflective qualities. Even as winter wraps us in a blanket of darkness, some brave cyclists keep defying the cold. 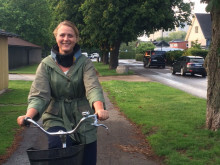 Hövding wants to increase awareness of these cyclists through an exciting competition. During December, Hövding is planning a competition in selected cities with clues posted on Facebook. These clues will lead to a time and a location to which the first cyclists to arrive will win a Hövding helmet. “For centuries we’ve understood that the best way to protect your head is by wearing something on your head. And here we come, challenging that old truth”, Fredrik Carling, discusses the technology behind the world's first airbag for cyclists in an interview broadcast live on US Channel CNBC. 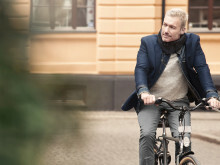 The Hövding CEO Fredrik Carling is presenting the world's first airbag for cyclists to a hundred delegates at a conference on the changing face of road safety in London on 24 January. The Road Safety Conference will focus on the challenges and opportunities faced by those involved in road safety in the UK. Now that summer is here many of us are lying in our hammocks enjoying our time off, as well as some good food and probably a drink or two. However, when the holidays are over it will be time to get back into everyday life again. Many of us live within cycling distance of our jobs. Despite this, we travel by car, bus or other means of transport rather than by bike. 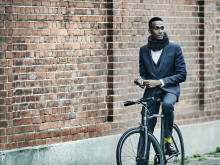 A number of different studies indicate that cycling is good for health and can even increase performance at work and reduce the number of sick days. 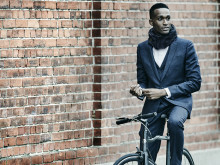 Cycling is simple and suits most people. In many ways, the bicycle is the perfect means of transport, but above all, cycling is enjoyable. Being able to roll past all those lines of cars during rush hour is a wonderful feeling. ​Cities have long been built up around and adapted for cars. Cars have been the prime means of transport for many years, and still are. Car drivers have long had a connected road and street network, adapted to the speed and expected volume of traffic. They are used to a uniform standard, functional signage, parking, petrol stations and other facilities designed to suit their needs. Bicycling is not just fun. Bicycling is also one of the best forms of everyday exercise. You getto where you are going in an environmentally friendly way, and you get fresh air and exercise for free. 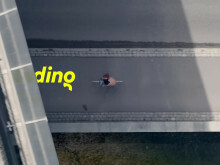 Short film showing the benefits of Hövding compared to traditional bicycle helmets.